The old saying “a picture is worth a thousand words” might need to be revised because, nowadays, it’s videos that are speaking volumes. The 2014 Cisco Visual Networking Index predicts that, by 2019, 80 percent of Internet content will be videos, which means recruiting strategies need to start adjusting. Considering a high-quality video can now be recorded on just about any mobile device, the excuse that creating video content is too time-consuming and expensive is no longer valid. Video can be a great — and easy — way to engage potential employees, take them through the onboarding process, and help them perform their day-to-day tasks. 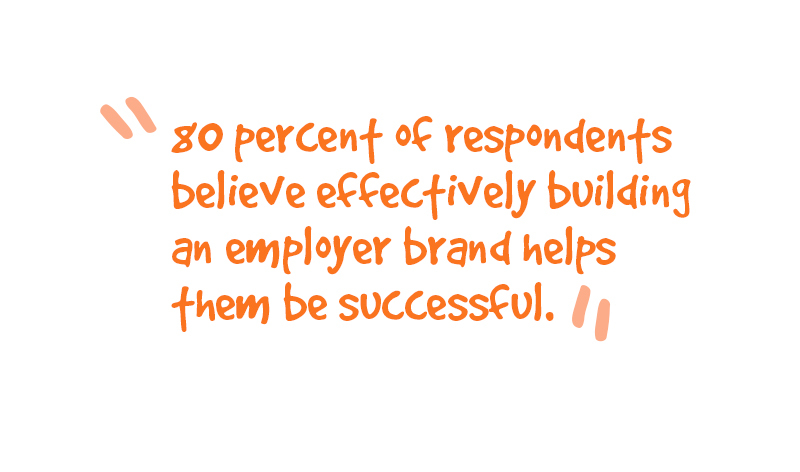 A report by Brandemix found 80 percent of respondents believe effectively building an employer brand helps them be successful in a variety of ways — including attracting skilled job seekers. “But my company doesn’t have a brand,” you might say. Guess what? It does, whether you’ve consciously developed one or not. Former and current employees, clients, customers, or anyone posting on your company blog or social accounts can affect how your business is viewed. If you don’t clearly present who and what your company is, it can keep you from hiring top talent. Creating brand videos allows you to craft the message your way and show off for job seekers. Highlight what the work environment is like by including clips of the office and interviews with employees. Don’t just ask them to talk about their job, have them describe what they love about the company, their favorite place in the office, or what the company’s spirit animal might be. It’s important to be creative so the personality of your company will organically come through via video. Take this video from Starbucks, for example. After exploding onto every corner in America in the 90s, Starbucks became a huge — but seemingly faceless — company. The video includes employees that have moved up in the company and their stories. It also features aspects of Seattle, the company’s hometown, giving viewers a sense of Starbucks’ heart and values. Briefly go into the company’s history and mission, what type of work it’s presently doing, and the company’s goals and vision for the future. Pay special attention in presenting your company’s future — potential employees want to know that they’ll not only fit in now, but ten years down the road. Feature the company values that are timeless, but also what innovations and opportunities are around the corner. Whether it’s a video detailing the job on your company website or a quick Vine saying “hey, check out our new job post” to your Twitter followers, videos give you a new way to share your employment opportunities. Job boards are flooded with new postings every day. After a while, all of the traditional text-based descriptions begin to blend together. This can confuse and overwhelm job seekers, so give them a reason to apply for your job over your competitor’s. Customized video job descriptions will add a personal touch and help your listings stand out. A 2014 survey conducted by the Talent Board found that 77.3 percent of job seekers said the job description was the most important part for them. However, a 2013 report from CareerBuilder revealed that 43 percent of respondents discovered the actual job description didn’t match the one listed in the job ad. Putting together a “day in the life” video for the listed position will give job seekers an honest and accurate idea of what their role in the company would be. Interview the co-workers they’ll be working with, so they can personally explain how they will collaborate together. This will offer a more interactive and engaging way to attract job applicants than text ever could. If you already have a company blog, start incorporating vlog, or video blog, posts as well. This is a great way to show prospective employees (and prospective clients) who you are and how you work. Interview clients you’ve been particularly successful with and have them share first hand what your company is capable of. Or, create a video that features a project from beginning to end. These types of video posts will give a very clear picture of how your company functions day-to-day. You can also host webinars sharing your knowledge of the industry. Host them live online first and encourage viewers to ask questions and engage. Once the live version is over, post the recording on your website so it can draw industry job seekers to your site months after it happened. Featuring employees that specialize in different areas of the business also gives you an opportunity to share your company culture. Consider creating an overarching theme for the webinars, but allow your employees to interpret that in their own ways. This will make the webinars not only informative, but also engaging. What’s more, by incorporating webinars, you can get the attention of quality talent who might have never heard of your company before. Watching your videos might convert them from a passive website visitor to an active job seeker. 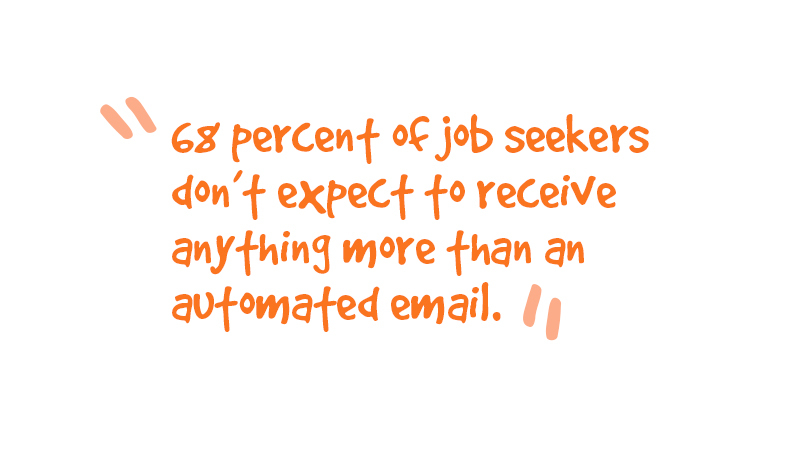 The 2014 Candidate Behavior Study by CareerBuilder found that 68 percent of job seekers didn’t expect to receive anything more than an automated email after submitting an application. Set yourself apart by sending a video thanking them for their application and outlining the next steps of the hiring process. Include a message from an executive, in order to give a face to the company, as well as links to important resources. Consider including a FAQ webpage for job applicants or other job postings they may be interested in. Also, clearly present contact information in case they have questions or comments concerning the hiring process. Depending on the size of your company and the schedules of those involved in the hiring process, it could take up to a month to reach a final decision on a candidate. In fact, a recent Glassdoor study of more than 300,000 interview processes revealed that — between 2010 and 2014 — the average length of the hiring process in the U.S. grew from 12.6 days to 22.9 days. Instead of drawing things out and waiting for everyone to be in the same place to discuss and decide on a candidate, incorporate video meetings to speed things up. Both job seekers and hiring managers can attest to how restrictive resumes and cover letters can be in accurately representing a candidate. One page on past experience and skills does little to show if someone is both a skill and cultural match for a position. Allowing candidates to submit a short intro, an elevator pitch, or a video resume gives them more leeway in creatively presenting themselves. This is a great way to encourage engagement with a position before a candidate is even hired. Creating a video requires more thought and involvement than a traditional resume. After all, job seekers can send the same resume to hundreds of companies, but they can only send one video resume meeting your requirements to your company. This will help ensure that all your applicants are serious about working for you. Popular video applications, like Snapchat, are quickly becoming a popular way to have job seekers apply for jobs. This Snapchat resume even went viral. In the time it would take you to glance at his resume, this candidate was able to creatively show he possessed the required skills, why he was personally interested in the company, and more. With video introductions, you can set a time limit for candidates to pitch their skills and experience for the job. You’ll not only get a good idea of who they are professionally, but also of their personality and soft skills. This will give you an idea of cultural fit before you even invite them for an interview and keep you — and your candidates — from wasting valuable time. Onboarding videos can be beneficial for all employees. Instead of receiving page after page of protocols and checklists, video tutorials are a much more efficient and effective way to train new — or retrain older — employees. These videos can be re-watched whenever the need arises and keeps the same questions from being asked over and over again. Of course, team leaders and managers should still be available to help new employees and answer their specific questions. But having the majority of the information presented in a video will allow them to spend less time training and more time doing. Videos also provide consistency across all employees. People make mistakes. While Sherry might remember to show Karen how to file new client documents, she might forget to tell Jack. Videos ensure that all new employees receive the same information. Video onboarding is especially beneficial with virtual and remote employees. Clearly, you can’t personally train your new hire if they live across the country, but you can ensure they’re getting all the proper information by providing them with video resources. You can also schedule one-on-one or group video chats to address questions that may arise throughout the new hire’s first couple of weeks. We can’t let it go without saying that video interviews are going to streamline the recruiting process. They allow both the hiring team and candidates to complete the interview at the time and location that best suits their busy schedule. Plus, candidates are more relaxed with the freedom to re-record answers to be certain they’re showing you their best self. And of course, don’t forget the added benefit of being able to re-watch any response as many times as needed. Video is quickly becoming king and it won’t be long until recruiting will be part of its domain. Using some of these new creative ideas in your recruiting strategies will help you attract the top talent you’ve been searching for. What other ways can you integrate videos into how you recruit new employees? Share in the comments below!